Custom designed, hand crafted invitations. We LOVE this paper. It comes in several different colors. Shown here is the pink and the white. This was one of three unique invites we designed for a client. In our last post you can see an example of how this design can be changed to fit any color scheme and match the individual style of each client. We came up with this unique construction idea that we think would be perfect for a wedding with a more modern/tailored feel. We love all the layers, lines and elements that go into this design. 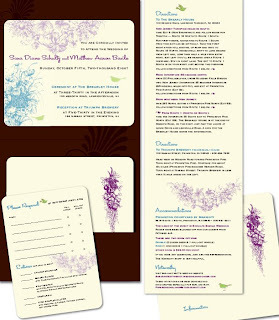 We also came up with a digital layout using a more feminine version of this design. 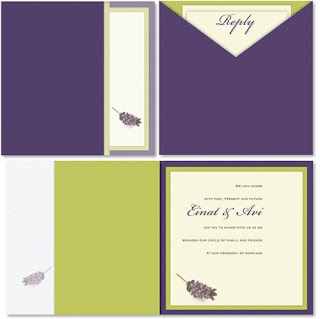 A client asked us to design around the image of the lavender sprig. 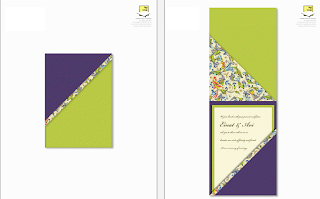 This shows the front of the invite, the back with the inset pocket, and how the invite would look opened. 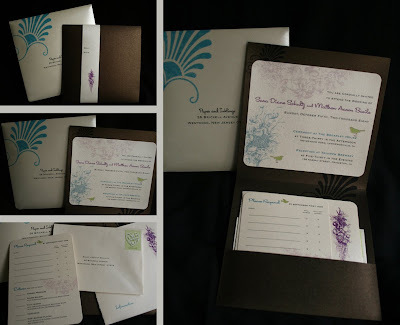 Here is an example of custom hand made invites we did for a bride and groom with a bird themed wedding. Their wedding colors were brown, purple, turquoise, and green. We incorporated their personality in each aspect of the design from the custom made envelope to the direction card. 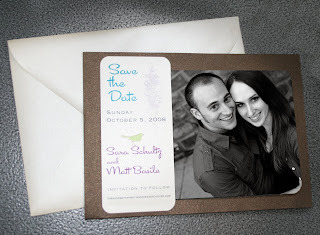 Sara and Matt also asked that we design a few other elements throughout their wedding. Here are a few pictures from the wedding photographer of our work in action. Thank you for visiting our new blog! We can't wait to start showing off our work. Please check back for updates.